‘Long’ & ‘Short’ of some Surfing History of Longy. By: Ron Brodhurst* written Dec. 2011. Peter Clare & Bob Pike, Long Reef. Long Reef’s many surf breaks. In the late 50’s (1958-1959) we first experimented with a ‘short’ board. This came about because one Peter (Pee Wee) Clare bought a ‘Malibu’ board from the Californians who gave surfing demonstrations for the 1956 Melbourne Olympics*. I was only thirteen at the time and had only recently had graduated from my surf-o-plane (surf mat) which we used to ride on the outer bommie at Long Reef to a custom made surf ski from Gordon Woods. Also the older guys (18-20 yrs) used to double us on their surf skis. These guys rode every surf break from Dee Why to Collaroy. But now, Peter Clare was demonstrating his Olympic Malibu board and that just blew us away. The surf ski was quickly sold. Back to Gordon Woods! I soon had my first Malibu although I’m not quite sure how long that board slept in my bed. Heaven had finally arrived on Earth for us. Peter being a very innovative guy and absolute surfing fanatic stared experimenting with different shapes and designs like radical Tear Drops etc. The idea of course was to make the boards even easier to turn. This eventually led to him cutting down his 1956 Olympics board bit by bit. All us young guys would try it out (Pete was about 5 years our senior) as it went through its shortening stages. We mostly ‘wiped out’ but at the same time would amaze ourselves with some of the turns and cutbacks we pulled off. The last I remember of this board it was under ‘Hansor’s” house – up the walkway to Lancaster Crescent, Long Reef. Rarick (still to this day involved in the professional surfing scene) on the ship back to Australia. He’s Hawaiian and he told me he was coming to Australia to find out about ‘our” SHORT BOARD revolutionary scene. I spent some time with Randy and I don’t recall any mention of the Short Board revolution happening anywhere else at this time to any extent but the broader acceptances was just around the corner. As a guy who thinks that if you’ve never surfed, you’ve never lived I hope this letter brings a little more insight to the thinking of this time. Long Reef was a Mecca back then. I remember counting over 200 boards on the inner and outer bommies during Christmas 1960.We had 4 straight days of perfect surf and weather. You could ride from the outer bommie to the beach on one wave. Also the outer bommies in particular were far more frequent in the 50’s and 60’s confirm this yourself with old timers. One of the biggest waves I ever caught though was on the German bank surfing with Ian Wallis (Wally), Russ King and Scotty Dillon on that day. That place functioning is sick! Another unbelievable break is White Rocks. When the weather patterns line up to give two swell directions unbelievable sling shot rides can happen. This enables hitting the second wave at high speed and at about 90 degrees to the wave you’re on; this sends you flying across the second face (sling shot) making sections and barrels you couldn’t otherwise make. You can actually feel the ‘G’ force. 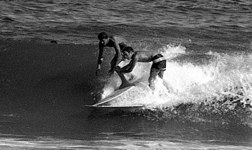 Long Reef mid 60’s, unknown on left, Nick deJongh right. Note: Ron Brodhurst also known as Ronnie Brodhurst-Hill, Ronnie Hill, or just Hilly. Alias Sun and Sand, Beach Bum and Board Rider, according to my High School (The Balgowlah Boogie Woogie Boys HIGH) sports master. We did cut school a lot.It seemed to be good every second day! Sorry it took so long hope it is useful for you Peter.